We are indeed living in a time of ‘Brilliant Technologies’. I studied Cognitive Science & Artificial Intelligence back in the mid ‘90s. The multi-disciplinary researchers dreamt about natural language comprehension and powerful AI computing power. Fast forward 20 years and they would be delighted to meet ‘Miss Siri and Mr Watson’. However, when assessing the impact of new technology on HR, we sometimes get dazzled by the ‘glare’. The biggest impact of living in a time of ‘Brilliant Technologies’ on HR is not the cool tools, but the way technology transforms our economies and societies, changing the workforce skills needed in a globalised economy. There is a relentless push for organisations to survive and flourish in this competitive environment. Since 2000, 52% of the Fortune 500 has disappeared, Professor Gary Hamel makes the prediction that 50% of the Fortune 500 today will no longer be with us in the next 10 years. He argues that survivors will need to move to Management 2.0. If our management structures are not suited for a digital age, the same principle applies to some of our HR people management practices. For example, our annual performance reviews and engagement surveys in a workforce full of freelancers; working 24 / 7 across the globe is suddenly looking very ‘Management 1.0’. We can now provide employees with better technology to manage their teams more effectively, such as tools that provide real-time feedback on performance and goals. What does this all mean for HR Technology? In his speech at HR Tech Europe in 2013, John Sumser took the historical perspective – he noted that we are at the end of the HR enterprise software era. The HR Technology industry has done its job well, and provided automated solutions for most HR processes. In some cases we have calcified these obsolete management and HR processes from the last century. We see the benefits of the cloud, mobile, analytics, robotic process automation and collaboration tools. The adoption of HR Software in the Cloud in combination with mobile technology is a catalyst for HR to empower managers to improve workforce productivity. There is a steady move to migrate HR systems from on premise to SaaS (Software as a Service). Along with the required HR process standardisation; this technology will reduce the total HR transactional effort with less HR administration support required. Savings can be reallocated to strategic goals such as developing talent, with learning solutions and collaboration tools. The new systems also allow better data quality over time and enable us to move from descriptive analytics, to predictive and prescriptive analytics where we can predict not only ‘when’ an event might happen, but also ‘why’. So the way we deliver people management is changing, driven by workforce, new business models and technological innovation. HR structures, organisation, policies and processes are also in need of a review to ensure they are fit for the future. 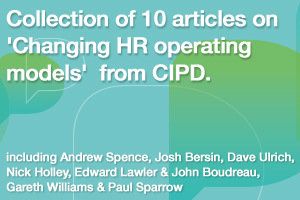 The CIPD recently curated a series of 10 articles from leading thinkers such as Josh Bersin, Dave Ulrich, Ed Lawler, Nick Holley and others, on ‘Changing HR Operating Models’, which is worth a read. What can you do to determine whether your Technology and HR Operating Model is Fit for the Future ? • Do your current HR practices deliver your organisational goals now and in the future? • What will your HR model (services, skills, organisation) look like in the next few years and will your HR technology support this? • What tools and solutions does your changing workforce require to achieve their goals? I believe we are indeed living in a time of ‘Brilliant Technologies’, but don’t be dazzled by the glare! What will I be looking for at HR Tech Europe? I am looking forward to the insightful conversations and presentations at the HR Tech Europe conference and aim to find examples of organisations that have found more agile ways of supporting engagement and improving performance to report on. I am also really interested in hearing about the journeys that organisations have gone on to adopting “Brilliant Technologies” and capture the lessons learned. Get in touch and let me know what you discover @AndySpence and #HRTechEurope, and I will hopefully see you in London or Paris in 2015! This entry was posted on Monday, April 13th, 2015 at 11:19 am	and is filed under Future of Work, HR Conference, HR News, HR Operating Models, HR Strategy, HR Tech Europe, HR Technology, HR Technology Conference, HR Transformation. You can follow any responses to this entry through the RSS 2.0 feed. You can trackback from your own site.